♥Easy to Use:Can receive three channels with 433MHz/100m distance, and receive water temperature from up to 3 locations, professional and practical. ♥Digital Screen:Clear LCD display, easy to see the data. 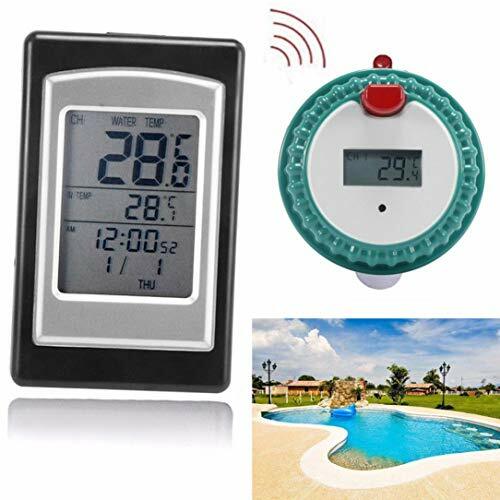 ♥Widely Used:Suitable for measuring indoor and remote outdoor temperature in swimming pool, pond and spa. ♥Please tighten the cover of the emitter before use. ♥Please put in basin for 3 minutes until no bubbles come out, then put in pool. ➤Please tighten the cover of the emitter before use.